Put a little colour in your life with Search For A Smile, a magical musical that's brimming with laughter and fun. 11 great songs are brought to life by 4 main characters, numerous supporting roles and a number of chorus groups. This concert styled show can be performed by a section of the school or by the whole school with most members being incorporated into the various chorus groups. The 11 performance items vary in style and include songs, dance numbers, creative movement and chanting. The performance is closed by a final celebratory song performed by the entire cast making for a grand finale. Small excerpts of dialogue are given to children in each chorus group and this gives a large number of children the chance to have a speaking role in the show. Search For A Smile is an easy show to stage as only a castle set is required and various movable flat sets can be wheeled on and off as needed. If performed with energy, confidence and humour the show will be a terrific and entertaining concert highlighting all aspects of the performing arts within the school: dance, drama and music. 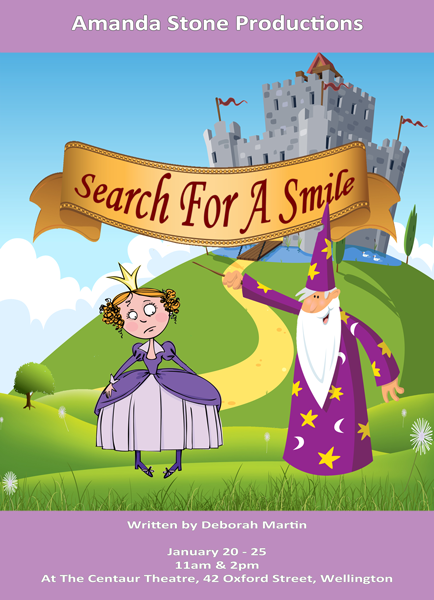 Search For A Smile is a quirky musical which blends together fantasy and modern elements. The plot revolves around the search for a smile for the princess who is a great disappointment to her self-absorbed parents. Instead of enjoying royal events the princess prefers to spend her time in the royal library. This leads to the princess being examined by the royal physician, Dr. Dot, who discovers that she has a faulty funny bone. The king decides that something must be done so he offers a chest of golden coins to whoever can make the poor princess smile. The media led by roving reporters Stacey Snoop, Tom Tellit, Greg Gossip and Barbie Babble report regularly on the progress of the princess. Various colourful groups visit from all over the kingdom with enterprising plans to make the princess smile but none are a success. In the meantime, the king has tired of being ruler and having to deal with the kingdom's problems so has forgotten to collect the taxes from his subjects leaving the kingdom in terrible financial trouble. In the end the princess emerges as the kingdom's hero as she is able to save it from financial ruin because of all the knowledge gained through her hours of study in the library. Her parents finally see her for the wise and kind person she is and the princess smiles at last! The simple yet engaging story of Search For A Smile is portrayed by a small core of main characters along with supporting characters and chorus groups. These distinct groups of characters can rehearse their parts separately before beginning to work with the chorus groups. During the live performance the main characters will come in and out of the wings as a way to link the different performance items together. The first group of main characters is the royal family. Queen Nancy is a self-absorbed and vain character who loves drama. She loves performing and is involved in many of the songs so a strong and confident singer will go great with this part. The king, George, is another self-absorbed character who is also involved in many of the song and dance numbers. The part of Princess Jane is a challenging one as it requires quite a subdued performance for most of the show. Over the duration of the show however, we begin to see how gracious and intelligent she really is so an actor needs to be able to demonstrate this character growth to the audience. Lastly there is the royal butler, James, who befriends the princess and tries to help her find her smile. He's also become quite exasperated with the antics of the king and queen. The second group of main characters is that of the roving reporters who tell of the progress in the smile search. Stacey Snoop, Tom Tellit, Greg Gossip and Barbie Babble are terrific smaller roles suitable for actors with good senses of humour. There are a number of other smaller roles for various characters including those that visit the royal family offering strange solutions to try and make the princess smile. The chorus groups (courtiers, Dr. Dot's assistants, crowd etc.) appear during every major scene to perform a corresponding song or dance number.